Technology, Apple, and Did Tim Cook Pull Off A Remarkable Feat ? 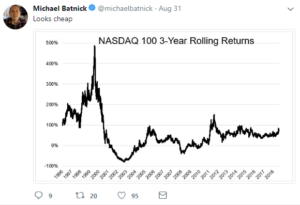 Michael Batnick, Ritholtz Wealth’s Director of Research, puts up a chart that perfectly articulates the what-seems-to-be misplaced anxiety over the Technology sector these days, and the constant comparisons to Technology’s halcyon days of the late 1990’s. Apple no doubt has a lot to do with this, since Apple’s market-cap weight in the Nasdaq 100 (QQQ’s) is 12.5% and 4.5% in the SPY. According to Morningstar data, Apple’s stock rose 20% in the month of August ’18 alone, and was up 22.2% for the 3 months ended August 31. The new iPhone’s are set to be announced September 12th, 2018. Both in 2012 and 2015, after the launch of the new iPhone’s Apple’s stock sold off 45% from $100 to $55 from Sept ’12 to July ’13, and then from $133 to $89 – $90 from mid-2015 to mid-2016. With the iPhone 10 or IPhone X launched in Sept ’17, we should be in the soft spot of the upgrade cycle for the smartphone, as we await Apple 11 on September 12th, and yet the stock rallied 20% in just the last 30 days in anticipation of the device. The “Tech Hardware” cycle is being turned on it’s ear by Apple. The company is actually pushing through price increases for the smartphone upgrades, when – over the last 30 years anyway – Moore’s Law has prevailed and while product utility and productivity has soared, the price of such hardware has usually declined. Think of the PC business in the 1990’s, where software utilization, graphics and RAM speed increased dramatically while PC prices declined. Apple is gradually working its way toward a $1,000 iPhone. To the 2nd bullet point, in Apple’s fiscal Q3 ’18, ended June 30, Apple’s iPhone unit growth was just 1% but the increase in ASP’s (average selling prices) drove a 16% gain in iPhone unit revenue in the June ’18 quarter. Given Apple’s weight in the Tech sector and it’s price action the last 30 days and 3 months, the expectation was that we’d be seeing upward revisions to Technology’s forward quarterly growth rates. In fact the Tech sector’s forward growth rates have changed little. Could this be impacted by the creation of the Communication sector ? There has been no response after reaching out to Thomson Reuters IBES. The Q2 ’18 growth rates won’t change much since Tech is all but done reporting. Given the performance of Technology, Growth, and Momentum for 2018 YTD, I thought we’d see upward revisions to growth rates in the Tech sector for Q3, Q4 ’18 and Q1 ’19. Tim Cook Pulls off a Remarkable Feat ? Tim Cook may have done what no other 1990s CEO did in the late 1990’s and early 2000’s i.e. use the success of their particular hardware or software business model to build other businesses that would carry the company forward after the inevitable competition appeared to crimp profit margins and growth. Think of Microsoft, Intel, Cisco, Sun Micro, IBM, Oracle and the other tech giants of the 1990’s: all capitalized on the secular expansion of corporate tech in the 1980’s and 1990’s (granted, IBM was late to the 1980’s, 1990’s secular tech party), from the PC to the server, to the network, (all primarily corporate-based tech), and then missed the tectonic shift that Apple and Samsung and Nokia capitalized on that was “consumer tech” driven, and from which ultimately emerged the smartphone. Microsoft has been the only 1990’s tech giant, to break significantly above its 1999 – 2000 high stock price, and that took nearly 16 years, and the Microsoft Board had to jettison Balmer and Gates and appoint Satya Nadella as the new CEO in order to get the software giant firmly headed in the right direction. Oracle is trying to do the same, but Larry Ellison is still a big influence on the company. The point of this being that it is extremely difficult to transition a dominant business and product as Cisco is learning, as they struggle to move from a hardware to a software company. Apple’s “Services” revenue business is now 18% of total revenues and revenue growth is accelerating, not to mention that this is higher margin revenue for Apple. I cant recall where it was heard or read but the Apple Services business is thought to be a Fortune 50 company on its own, which is truly, truly amazing. The Apple “ecosystem” has been a term used for a while, but the rapidity at which Services has become a material part of Apple’s business is shocking. Apple is in the process of doing what no other tech hardware has done (that I know of anyway): as a company and a culture, Apple recreated itself on the fly to capture the next evolution of smartphone’s and devices (and data). Mr. Buffett missed the first 18 years of Apple’s run as a stock, but he may not have wanted the tech hardware business model and instead bet on the Services and possibly emerging Health Care dynamic. Tim Cook took a lot of flack during 2012 – 2013, and then again in 2015, but he may have been hiding the straight flush all along. Still, I’m a little puzzled forward growth estimates for the Tech sector haven’t moved much. Thanks for reading. Just thinking out loud. It is Cook himself that likes to make the Fortune comparison. He has done it in several earnings conference calls. Here he does it in an interview with Cramer. Jim Cramer: Do you want to try to talk to me about what Fortune size company? Tim Cook: We have already surpassed a Fortune 100, and what we have said is versus where we were in ’16, we are going to double by 2020, that would mean we would be at least a $48 billion per year services business. Jim Cramer: You did pull out wearables, is wearables therefore a real mover or is it just something you’re proud about? Tim Cook: Our revenues grew almost 50 percent and that is very much powered by the watch and AirPods. So it was another record quarter for the watch, we have really hit an air pocket with the cellular series 3, and we had more carriers adopt it so in the quarter including starting in mainland China on that. And so it is doing extremely well. And that one we did say, if you look on a backwards basis, we are a Fortune 300 company already in the wearable space.